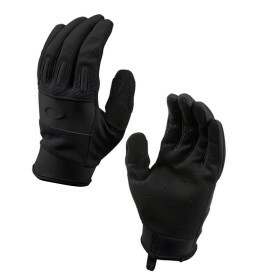 Oakley Lightweight FR Glove (Black) » Protective Solutions, Inc.
With the old technologies of flame resistance, you may as well go into battle with oven mitts. New innovations allow for lightweight designs that maximize dexterity and the tactile feel needed in critical operations. This is the LIGHTWEIGHT FR GLOVE, an Oakley invention that meets military flame resistance requirements with a low-bulk design of high performance. We reinforced it with Kevlar® in the knuckle and finger joints, and for added dexterity, the palm is constructed with durable Pittards® leather. When you’re going in fast and light, this is the glove that gets the job done without sacrificing essential protection.